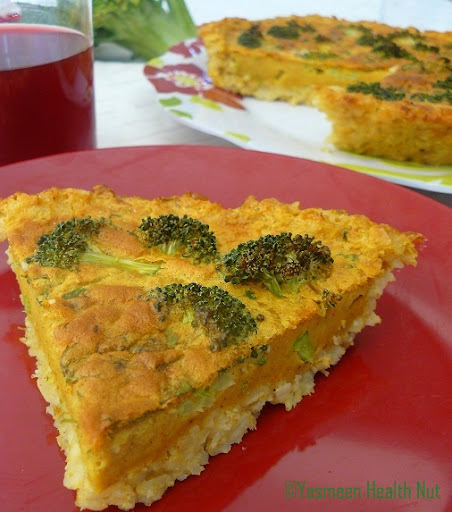 A slice of wholesomeness,brimming with goodness of broccoli and brown rice,the quiche is hearty meal in itself. Originating from Germany,also revered in France,unquestionably quiche is a popular savory pie of the region.A quiche is usually made with wheat dough crust and filled with eggs and generous amount of cheese.My reincarnation of quiche here is from Vita mix cookbook,that is commendably low in fat calories and has a decent touch of whole grains. The brown rice crust works wonders,no rolling needed,just cook and press over the baking dish.The result is crunchy and filling crust.Also for a vivid rice eater like me,usually pairing rice with dal and curry,the quiche was was a surprisingly neat rice recipe. 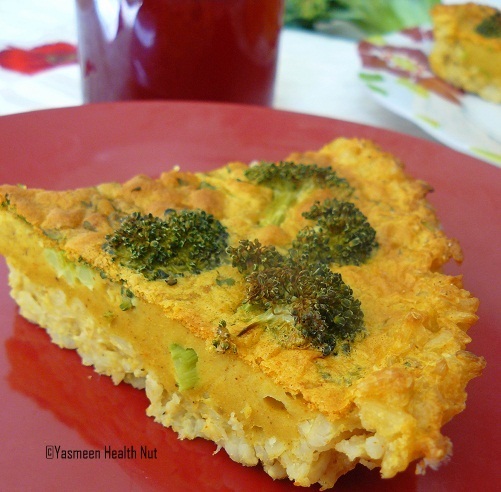 Recipe : Broccoli Quiche With Brown Rice Crust. Blend the eggs,milk,spices and salt in food processor or a blender,just until combined,about 30 seconds. Mix 1/4 cup of the egg mixture in to the cooked rice by hand.Press in to a baking pan or pie dish(8x8inches).Bake for 10 minutes. Increase the heat of the oven to 375F. Place broccoli in the center of pre-baked rice crust.Pour rest of the egg mixture over the broccoli.Bake for 35-40 minutes until the top is brown.Cool few minutes before slicing.Serve warm. Left overs can be refrigerate in air tight container for about a week.Warm in the oven before serving. Broccoli is a member of Cabbage family,with botanical name Cruciferous.Health Nut Challenge 5 is focusing on these crucial vegetables.Please find the details of the challenge and link up your creations on the announcement page before April 30th. Beautiful quiche yasmeen.. I badly want now.. With brown rice crust looks really impressive will surely try it. Wish to have that slight immediately. A wonderful idea! That healthy quiche looks very scrumptious! 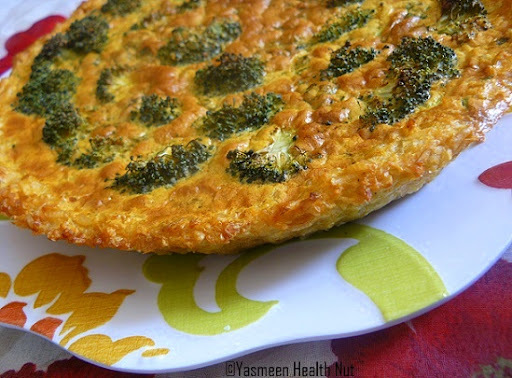 This twist on the classic quiche is a new one for me Yasmeen! Love to eat it and not feel guilty about it too! A brown rice crust sounds excellent, a great idea! thnx for the awesome recipe...i use brown rice for a lot of grain dishes...this looks idel for snack/meal times! I love anything with brown rice. The quiche looks fabulous! Looks very well baked and tasty. 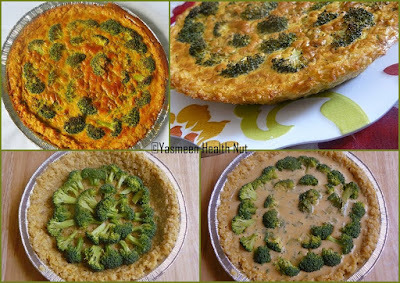 Loved the way you have decorated the pie with all the broccoli. Looks yummy. I love the sound of the brown rice crust. Way better for you than pie crust. This looks delicious! Brown rice crust is a wonderful idea, quiche looks healthy. What a fabulous idea! Now I'm ready to give quite a few dishes a healthy makeover! That is an innovative crust! Wonderful quiche! I would have never thought of it! We eat brown rice and would love to make this crust with some yummy filling. I love how neat the slice is. that definitely is my kind of food! The brown rice crust does sound and look pretty impressive. Love the flavours your use. Beautiful quiche . healthy one. i love it. Great idea and great quiche! What a healthy way to cook quiche.Mine are mostly cheesy.I like your lighter calorie one. that's a nice healthy and less caloric version of the quiche!!! lovely twist as usual Yasmeen!!! cheers!!! I love broccoli in any form. This is something new to me. Bookmarked it. This is crazy good stuff. Wow Yasmeen a very nice and healthy quiche.Very delcious looking.